Debashis Sinha’s creative output spans a broad range of genres and media, from solo audiovisual performance projects on the concert stage to the interior spaces between 2 headphones. Driven by a deep commitment to the primacy of sound, Sinha has developed his creative voice by weaving together his own experience as a 2nd generation south Asian Canadian, his training with master drummers from various world music traditions, a love of electronic and electroacoustic music and technology, and a desire to transcend the traditional expectations of how these streams might intersect and interact. Debashis Sinha’s refreshingly unexpected contemporary and innovative performances cross time and cultures and show him to be a true citizen of Toronto and the world. The wide range of audio, video and audiovisual works and performances that Sinha undertakes, while varying in concept and content, are nonetheless a result of an artist with a fierce desire to expand the notions of what it means to express and be influenced by a life in/between cultures. He has appeared as a solo artist at the Sound Symposium, ORF Kunstradio, Deutschlandradio Kultur, the Art Gallery of Ontario, Madrid Abierto, MUTEK, the Guelph Jazz Festival, Radio National Espana, and the International Symposium on Electronic Art, to name a few, and as a member of various musical ensembles across the country and internationally. …Sinha delivered a set that was at times contemplative, noisy, raucous, all constructed with beautifully contrasted pieces, instruments, and sounds. His music had a clear sense of honesty and purpose, and it was stunning to see the depths of someone’s craft so clearly on display. 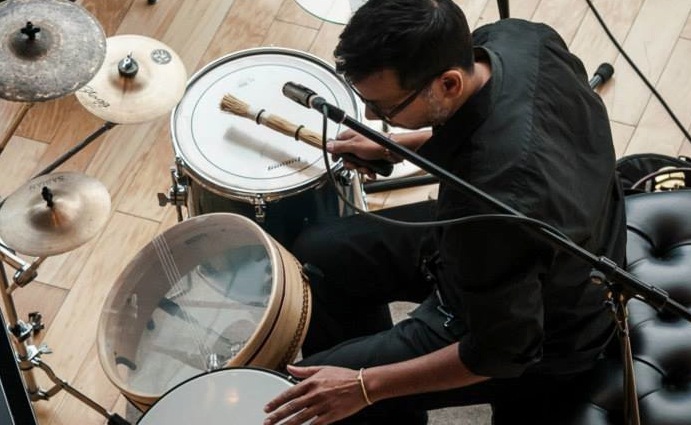 Sinha’s continuing musical practice and re-interpretation of himself as an artist comfortable working in various media have allowed him to realize projects and performances from St. John’s, Newfoundland to Berlin, Germany. His unique take on the place of sound in storytelling places him in demand as a composer and award winning sound designer for theatre, contemporary dance and moving image, with long artistic relationships with choreographer Peggy Baker and a busy schedule with many of Toronto and Canada’s foremost theatre companies including Soulpepper, Nightwood Theatre, Young People’s Theatre, The Stratford Festival, and others. He continues to perform as a percussionist and electronic music artist on the concert stage both solo and with in ensemble on various projects.